In addition to Six By Six, Carol and Brian are enthusiastic members of a larger band called Lucid Diversity. They love to play all kinds of acoustic music including: country, celtic, bluegrass, traditional, blues, rock, pop and folk. 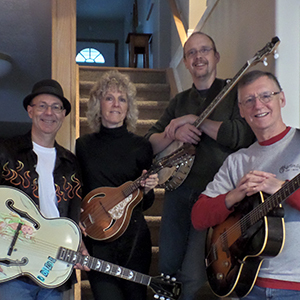 Dave Bradt first became smitten by banjo and enjoyed years of playing 3-finger and clawhammer. A chance meeting with a Dobro student changed everything he became a Resophonic guitar enthusiast. Dave's latest love is the bass guitar. Brian Howe started playing guitar when he was 14 after hearing the Kingston Trio and got hooked on folk music. In the late 1960’s he played in a group out of Winnipeg called Maple Sugar. They toured professionally for a time. Now Brian just plays for the love of it. Brad Tomlinson is a late in life player having picked up the guitar at age 46. Brad loves guitars and is known to have G.A.S. (Guitar Acquisition Syndrome) with a few mandolins and other instruments also creeping into the house. Carol Bloor is a flatpicker and fingerstyle guitarist who is mining the wealth of folk and bluegrass from the 1960s forward. Together, they are Lucid Diversity. Where can I see them perform?